The need to mass transport items like raw materials, machine parts, and products in various industrial sectors during Japan's economic boom period prompted the development of many industrial mobile machines. Many of these mobile machines were equipped with various types of rubber-coated insulated electrical cables supplied by our company. We are ever aware that the role played at that time by these insulated electrical cables continues as our challenge today: to make every effort to develop new products and refine our manufacturing expertise in all of our production activities. With the following targets of Quality, Cost, Delivery and Environment positioned as our key facets of our motto, we will strive to align our efforts with them. 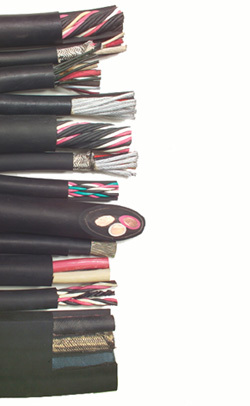 Q:Quality We will maintain a thorough grasp of how our cables are used to provide mobile cables with the quality and performance to match our customers' requirements. C: Cost We will make constant efforts to improve our productivity to reduce product costs while providing our customers with products that best fits their needs. D: Delivery We will produce customized products on efficient production schedules to be able to deliver them in the shortest possible times. Copyright 2004　TAISHO ELECTRIC CABLE CO., LTD.